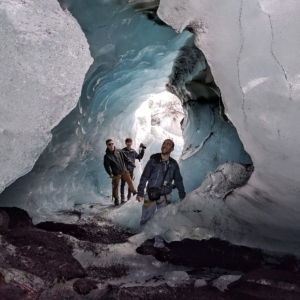 Planning a trip to Iceland this winter? Looking forward to exploring this spectacular season behind the wheel of your rental car? Great idea! A winter wonderland awaits! 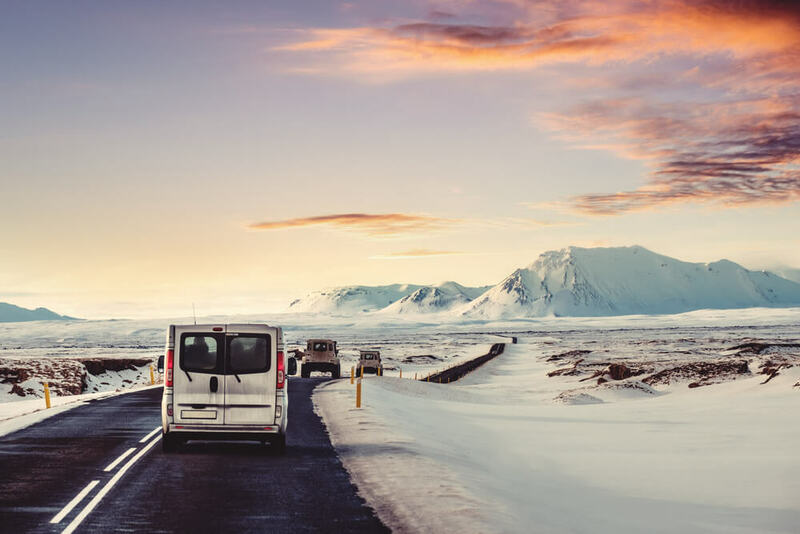 Driving in Iceland in the winter however can be a challenge and is therefore not recommended for the inexperienced driver. Handling a vehicle in such weather – especially on icy mountain roads – requires careful attention and good driving skills. We recommend reading through this article to make sure that your adventure will not end in misadventure. Make sure to plan ahead before embarking on your adventure. Check the weather and road conditions before setting out. Don’t take unnecessary chances. Allow yourself extra travel time or wait for conditions to improve. The best way to get information about road conditions and the weather on the road system is to call 1777, open from 6:30-22:00 in winter. On this official road safety site, information on road condition and the weather is updated frequently during the day, especially during winter. Driving sensibly during winter is essential and it is important to stay calm, don’t rush, leave plenty of distance between your car and the vehicle in front of you, brake gently, and slow down well in advance of junctions and bends. Stop regularly to clear snow from your headlights and number plates. It’s a good idea to allow extra time if planning a lengthy journey in the winter, and to keep a flask of hot drink, bottled water, snacks and warm blankets in the car, just in case. Icelanders are used to driving with ice and snow on the roads and during heavy snowfalls. Traffic generally runs as normal during snowfall, albeit at a slower speed. An impressive army of trucks are employed to keep the main roads – especially around cities – open, but some roads at high altitudes can be closed temporarily. Before getting in the car, check the level of windshield washer fluid. The tank should be full of winter windshield washer fluid. You will quickly realize that winter driving in Iceland makes for a dirty windshield; you will be using your windshield wipers often. Running out of windshield washer fluid will greatly reduce visibility, affecting your own safety and the safety of others. Our best advice is to keep an extra gallon of windshield washer fluid in the trunk of your car. The brakes – treat them nicely! Never brake suddenly. If you have to stop quickly, pump the brakes rather than slamming them on. Slow down as you approach a curve rather than braking in the middle of it, which could cause you to lose control of your vehicle. Sometimes we have the impression that the road surface is dry, when it may in fact be covered with a slick and subtle layer of ice, almost invisible to the naked eye. While this is not always the case, driving as though the road is covered in ice will help you to adopt safe driving habits. Sunny weather can have a large effect on your visibility and be risky while driving. Then sun sits low in the sky during winter and often completely in the driver’s line of sight. When combined with icy or wet roads – the reflection can be blinding. To have the best visibility possible make sure that your windshield are clean and that your windshield wipers work properly. Finally remember your sunglasses. If you get stuck in snow – start digging the snow out from in front, underneath and in back. Clear a path long enough for wheels to move forward and back a few feet, assuming you have that much space on either end of the car. Remove any snow around the tires that’s higher than the ground clearance of the car. Dig out snow from under the front of your car. Also make sure to dig out the tailpipe before you start the engine again. Put your vehicle in the lowest gear. If you’ve got a four-wheel drive SUV or pickup, engage the low-range gearing. Move forward just a bit. Now slowly back up. Don’t rev the engine. Stop, then put it in forward and apply a little gas. This can tamp down loose snow and maybe give you enough traction to get out. Listen carefully. If you hear any tire spinning, take your foot off the gas immediately. If you can’t get out by your self please call for assistance. DO NOT LEAVE THE VEHICLE. The weather can change extremely quickly. According to Icelandic law everyone must wear a seat-belt regardless of where seated in the car. All children must be secured in the car in a seat and restraint system suitable for their age, size and weight. They can travel in the front or rear of the car. Over 36kg or 135cm the child can sit in a standard car seat using standard seat-belts. 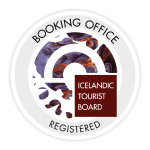 You have to be 17 to drive in Iceland although most car hire companies will insist you are at least 20 year old and have held your licence for at least a year. The minimum age to rent a 4WD or a minibus is 23 years old. Off-road driving is forbidden in Iceland. It is as simple as that! The speed limit in populated areas is usually 50 km/h, except for thruways where it is in most cases 60-80 km/h. However, in residential areas it is usually only 30 km/h. The main rule in rural areas is that gravel roads have a speed limit of 80 km/h, and paved roads 90 km/h. Signs indicate if other speed limits apply. You must carry your driving licence at all times while driving. If you need to make a call with your mobile phone, or make other use of it, pull off the road and stop the vehicle. Remember that it is illegal in Iceland to talk on the phone while driving. 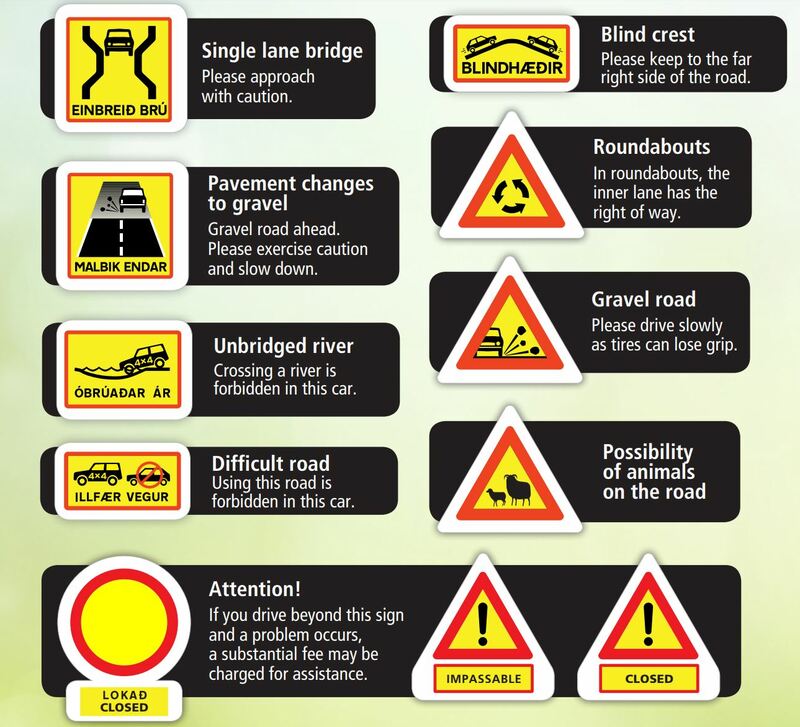 Below are street signs that you may come across while driving in Iceland.